Virtual Reality Experiences are quickly becoming “Must Have” attractions. The Extreme-Machine creates a VR experience tailored to each user’s interests and desires. Now, you can feel the force and potency of a star athlete or adventurer – strong, determined, courageous and daring. This is one of the simulator’s most important features. Please tell us about your VR offering and your company’s latest developments. CEO Xtrematic Vladislav Moshinski: You know what else is an artificial environment that doesn’t translate at all well to the real world? With the Extreme-Machine VR simulator, our company offers the chance to experience a thrilling sense of risk and have an unforgettable adventure! We want users to immerse into a depth of excitement never before imagined possible, and to explore the limits of their capabilities. Extreme outdoor sports are a common way to experience intense emotions, inciting fervor to the point of delirium, pushing one’s physical limits to the max, while helping a person to conquer their fears. Not everyone, however, can afford such sports because of the costs involved to train, buy equipment and travel to distant locations. Now, a revolution in entertainment is underway, and virtual reality fun has blasted forward to the next level, with something for everyone that will excite even the most jaded gaming enthusiasts! 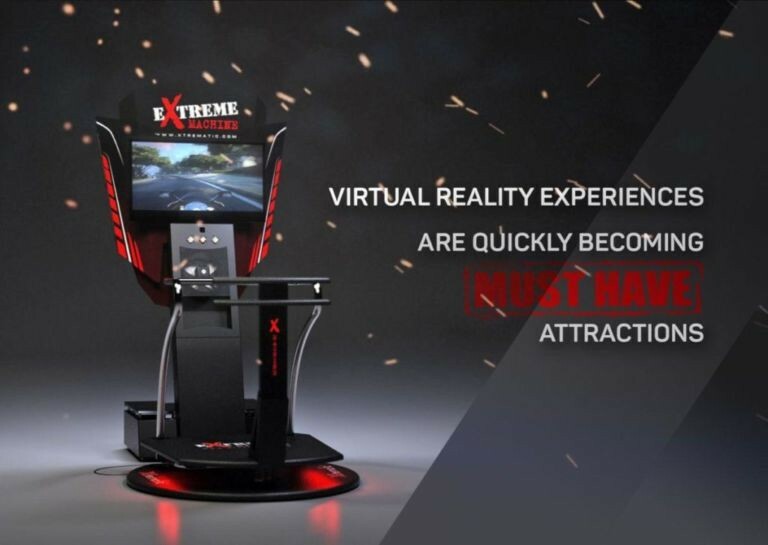 The Extreme-Machine VR simulator has already received excellent reviews from experts in dozens of countries and has captured a leading position in the global market. Virtual Reality opens exciting opportunities for business in the entertainment industry. And we created a VR-simulator that is in great demand and which people really love! VR has had a number of false starts over the years, we hear from manufacturers that the technology has now caught up, and VR’s time has come. Is this the case? If so, what technological developments have led to this? CEO Xtrematic Vladislav Moshinski: Xtrematic the world’s leading technology company, dedicated to developing VR-content and creating realistic VR Sports simulator “Extreme-Machine” with Oculus Rift, HTC Vive, and Samsung Gear VR, providing extreme sensations with no risk to life. In our competence creation of exclusive software and hardware. We mainly specialize in extreme sports and extreme adventures. The “Extreme-Machine” VR simulator has already received excellent reviews from experts in dozens of countries and has captured a leading position in the global market. We have been working since 2012. During this time, our customers have become a lot of reputable companies around the world in 50+ countries. We’re the best! The main advantage of our Extreme-Machine VR simulator is that every user experiences genuine and intense emotions! Your pulse pounds like mad; you feel the fear, horror, a powerful adrenaline rush and a wild unbridled burst of emotions! Our extreme simulator allows you to experience the same intensity just like in real life. There are more than 30 exclusive films that can be transformed into a virtual reality park! Our VR simulator makes it easier to build a business in 21st-century entertainment! Others have tried to produce such simulators, including for extreme sports. They tried to replicate the sensation of overload, speed and even a person spinning in a drum, turning upside down, and even changing clothes. While interesting, these simulators are just for one sport. I appreciate what they’re trying to do. But the concept of our simulator is quite different. We wanted to make a universal simulator to recreate the intense emotions and energy rush experienced by an extreme athlete and adventurer; and which gives the user the chance to try a wide array of sports – in one place! What is new? Are there elements you are hoping bring to VR that we haven’t seen before? What can you tell us about these? CEO Xtrematic Vladislav Moshinski: Extreme-Machine now supports Samsung Gear VR! The idea to use Samsung Gear VR on the simulator Extreme-Machine has been in our company for a long time. Now Xtrematic has integrated its hardware and software solution with the Samsung gadget. Besides Extreme-Machine simulators works with Oculus Rift and HTC VIVE. Gear VR connects to the Extreme-Machine attraction through wi-fi, which is convenient due to lack of wires, and it works just like in Oculus rift — the user feels the vibration, the graphics look as realistic as possible. Presentation of the joint product Xtrematic and Samsung took place at the largest festival MadFun Fest in Barcelona, where three of our films demonstrated: an exciting virtual flight over the mountain valley of Freedom Fly, extreme ski downhill Unreal Snow Slope and simulator of the legendary attraction “Buster” — City Hammer. All these films have an exciting script, allowing you to plunge into a real sport and they give a great experience. Freedom Fly is the extra-realistic virtual movie. After the player climbed the mountain and approached the abyss, he has only one choice – to jump down and hover over the beautiful mountainous terrain. It’s incredible feelings for players, who love adrenaline rush! City Hammer is the favorite attraction of millions of people! Always causes fear and at the same time delight! Splash of adrenaline! And let us introduce Unreal Snow Slope VR-simulator. It’s ski downhill giving the same sensations as the real sport, but not dangerous for your life. You can control the movement of the skier on the platform !!! Dive into virtual reality and manage it! Now, this has become easier with Extreme-Machine simulators and Samsung Gear VR! How do you see VR changing in the coming years? What application in the amusement industry do you see it being put to? CEO Xtrematic Vladislav Moshinski: VR-park so wonderful and innovative idea! Xtrematic has been working in this market since 2012 and all this time we see how people like VR-entertainment! And we love what we do! Now we create a large project – a Virtual-Reality park, dedicated to extreme sports and extreme adventures. The premiere of this project will be coming soon – it is under development. The Extreme-Machine is an exclusive experience! All our games are unique with no counterpart anywhere in the world. This is truly a revolution for the VR industry, and the movies and games constitute the next generation of VR entertainment. The Extreme-Machine is rapidly growing in popularity across the globe! With the exception of Antarctica, it’s played on every continent because it’s a fantastic form of entertainment and a great way to pass leisure time! Right now we propose to buy a simulator of extreme sports. High-quality graphics and reliable design – we produce our own product and adhere to high standards.